A couple of months ago I tasted some wines from Domaine de Marcoux, a southern Rhône producer, thanks to French-Swedish online wine dealer Caviste. This was the first time I tasted this producer chez Caviste but I have encountered the odd bottle before. My stylistic impression of the wine is that they are medium bodied, but still with rather generous fruit and distinct acidity – in particular for being from southern Rhône. Taken together, they give a fresh impression and go in the elegant direction, but are still characteristic as southern Rhône wines, i.e., the alcohol can be felt a bit more clearly than in more northern French wines, and there are some presence of dried herb notes. The amount of oak used are on the scale of moderate to none at all, and the extraction is moderate. 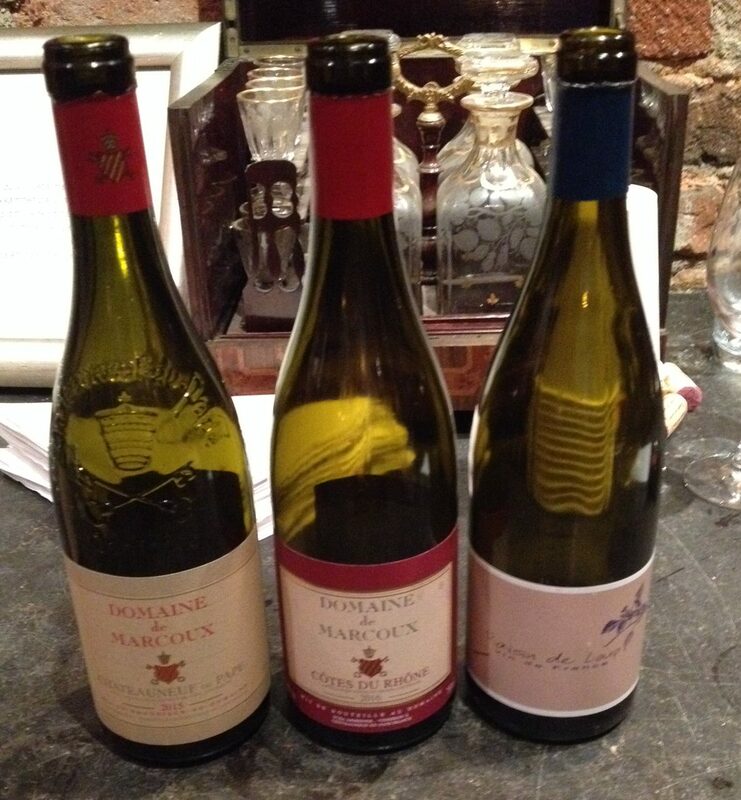 Domaine de Marcoux started to use biodynamic cultivation already in the 1980s, and were certified organic in 1991. Vin de France, originating from vineyards close to the Rhône river. The previous vintage was composed of 54% Syrah, 26% Grenache, and 20% Caladoc. (The latter a grape variety which is supposed to be able to contribute rather much tannins.) Vinified in cement vats (no oak). A juicy nose in a pure style with cherries together with some dark cherries and blackberries, plus some crushed stones. Juicy palate, again with cherries and some blackberries, good acidity and some reasonably firm tannins which are somewhat prominent. A pleasant wine with somewhat firm palate, could be cellared for some time, 85+ p.
An entry-level wine intended by the producer for uncomplicated drinking. The nose reminded me somewhat of a good “contemporary” Beaujolais, but it is different on the palate. In this vintage, the wine would probably benefit from being cellared for a while, sometime this year or later. The previous vintage was composed of 60% Grenache, 30% Syrah, and 10% Mourvèdre. Vinified in cement vats (no oak). Nose with cherries and mixed berries, some flowery notes, liquroice, and crushed stones, There are some character of sweet berries without the wine really giving a hot vintage character. Compared to the previous wine, the nose is bigger and more flowery. Palate with good concentration of berries, notes of cherries and mixed berries, good acidity, some tannins, a slight alcoholic fire in a typical southern Rhône way, and a firm finish. A serious Côtes-du-Rhône that surely would benefit from a few years of cellaring, 88+ p.
The previous vintage was composed of 85% Grenache, 10% Mourvèdre, and 5% Syrah. Vinified in a mixture of cement vats and oak barrels of different sizes. A generous and elegant nose with rather ripe red berries, cherries, a hint of blackberries and liquorice, and some flowery notes. Palate with a good concentration of red berries, a generous character with some alcoholic fire, good acidity, stony minerality, some tannic bite but where the tannins are rather well embedded in the fruit, and a stony aftertaste. Fine balance but with a characteristic southern Rhône style. Young, but approachable now, 90(+) p.
At present, this wine is a bit more accessible than the “middle wine”, but at the same time is the wine that most deserves cellaring. This entry was posted in Grenache, Rhône. Bookmark the permalink.